Storms River is one of Tsitsikamma’s main attractions. Sheer cliffs drop dramatically into Storms River Gorge until the fresh river water meets the ocean. This spectacular natural site is usually admired either: from high above on the N2, or from the wobbly Storm’s River Bridge at the river mouth. However, if you want to truly experience this site, you will need to join us on a kayak. Explore the Gorge in its entirety, getting an up close and personal look at the serene pools, eerily deep caves, and ancient forests. Your trip starts from the Storms River harbour, right next to the beach. 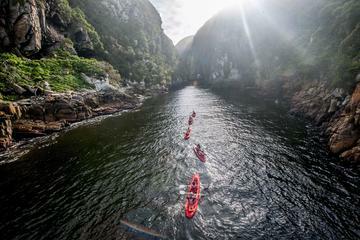 From there the group takes a short paddle across the bay to the mouth of Storms River. Once at the mouth, you travel under the suspension bridge and up the river. Please note that if the sea is too rough you will follow your guide on a short walk through the enchanting Tsitsikamma Forest to the river mouth. In such cases, the paddle will start from here where the water is calm. Once you have passed under the bridge, you are you flanked on either side by dramatically sheer cliffs. From the water, the cliffs seem to stand hundreds of meters tall. Before you are able to fully take in your surrounding, you are directed towards a dark cave filled with peacefully shy bats. After some time the water will become too shallow for the kayaks. It is then that the lilos are readied. These fun, shallow water vessels will take you the rest of the way. Furthermore, there are many opportunities along the route to partake in rock jumping. More adventurous explorers will find themselves scaling the cliffs on either side, only to leap into the deep pools below. This makes for a truly spectacular photo opportunity. Kayaks are provided, however, if you enjoyed the adventure consider purchasing your own tandem kayak.